Zoe and her family, who foster rescued Great Pyrenees dogs, hope that their furry friends will help the new boy next door find his voice. My Two Cents: This is a heartwarming story for dog lovers everywhere. Zoe’s entire family serve as wonderful roles models. Her mother is passionate about rescuing unwanted dogs. Her father is a veterinarian. Her sister Alice has a vivid imagination and see everything through the lens of an author writing a story. Zoe is patient and courageous, especially when it come to her relationship with the new neighbor, Phillip. Minor spolier alert: If you’re looking for high drama, this is not the book for you. There is just enough drama to to add a hint of danger. 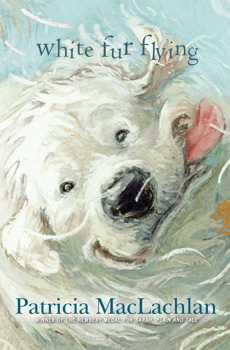 This is not a tear-jerker… no dogs die in this book. This book would make a great read-aloud for any class. I would be the perfect choice for October, which is Adopt a Shelter Pet month. You could even tie in community service projects with the local animal shelter. Bial, Raymond. Rescuing Rover : Saving America’s Dogs. Boston: Houghton Mifflin, 2011. Print. Kehret, Peg. Shelter Dogs : Amazing Stories of Adopted Strays. Morton Grove, Ill.: Albert Whitman, 1999. Print. Laidlaw, Rob. No Shelter Here : Making the World a Kinder Place for Dogs. Toronto: Pajama Press, 2012. Print. McDonnell, Patrick. Mutts : Shelter Stories. Kansas City, Mo. : Andrews McMeel Pub., 2008. Print. Nuzum, K A. The Leanin’ Dog. New York: Joanna Cotler Books, 2008. Print. Paulsen, Jim, and Gary Paulsen. Road Trip. New York: Wendy Lamb Books, 2013. Print. Fish Finelli: Seagulls Don’t Eat Pickles by E. S. Farber. Illustrated by Jason Beene. Mystery. After making a bet with Bryce Billings, Norman “Fish” Finelli and his friends, Roger and T. J. set out to find the lost treasure of Captain Kidd. The boys worry when they realize the Mystery Man, and his equally mysterious partner, are also searching for the treasure. My Two Cents: This is a great mystery for fourth graders with plenty of opportunity for extension into other curricular areas. Fish, Roger and T. J. have vivid imaginations and distinctive character traits: Roger seems to be the practical joker in the group; T. J. is constantly snacking on something and Fish seems to be a walking encyclopedia. In fact, “Fish’s Fun Facts,” random bits of trivia associated with the story, are interspersed alongside of the text. I’ll have to admit though, T. J.’s constant snacking on sugary treats has me a bit concerned that he’s on the fast track to obesity, diabetes, or both. There is just the right amount of silly dialog, gross-out humor and word play to make this book appealing to both girls and boys. Throughout the book Beene’s illustrations are black and white caricatures of the action. As the book ends it’s clear that this is the first in a series. I would have liked Farber to include an author’s note at the end of the story, explaining which facts about Captain Kidd were historically accurate, and recommending additional resources. There is a discussion guide available from the publisher. “Talk Like a Pirate” day is Thursday, September 19th. This book would be a great way to work it into your class. Avi. Windcatcher. New York: Avon Books, 1992. Print. Bryant, Jennifer. Kaleidoscope Eyes. New York: Alfred A. Knopf, 2009. Print. Cheshire, Simon. The Pirate’s Blood and Other Case Files. New York: Roaring Brook Press, 2011. Print. Colfer, Eoin. Eoin Colfer’s Legend of– Captain Crow’s Teeth. New York: Miramax Books/Hyperion Books for Children, 2005. Print. Dixon, Franklin W. The Twisted Claw. New York: Grosset & Dunlap, 1969. Print. Harrison, David L. Pirates : Poems. Honesdale, Pa.: Wordsong, 2008. Print. Lassieur, Allison. Pirate Hideouts : Secret Spots and Shelters. Mankato, Minn.: Capstone Press, 2007. Print. Levy, Debbie. Sunken Treasure. Detroit: KidHaven Press, 2005. Print. Mason, Paul. Pirates. North Mankato, Minn.: Smart Apple Media, 2005. Print. McDonald, Megan. The Mad, Mad, Mad, Mad Treasure Hunt. Somerville, Mass. : Candlewick Press, 2009. Print. O’Donnell, Liam. Pirate Treasure : Stolen Riches. Mankato, Minn.: Capstone Press, 2007. Print. Osborne, Mary P. Pirates Past Noon. New York: Random House, 1994. Print. ‘SEAGULLS DON’T EAT PICKLES!’ Roger yelled at the top of his lungs. Twerp by Mark Goldblatt. Realistic Fiction. As penance for his actions, Julian Twerski’s English teacher, Mr. Selkirk, requires him to write about the event that caused his recent suspension from school. The project stretches through the school year as Julian avoids studying Shakespeare and avoids discussing the topic. My Two Cents: This is a compelling story, set in the late 1960’s, about a boy who knows he’s done something wrong, but doesn’t want to admit it. Each chapter chronicles another misadventure in which he tries to show that what he did to cause his suspension was not as bad as some of other things he has done in the past. Julian is a very likable character and even though he makes a lot of poor choices, he also makes his best effort to make amends. I can really relate to Julian because he communicates much better in writing than he does orally. As the story progresses you can see the writing on the wall (no pun intended) as he documents his conversations. You feel for him, when those conversations lead to misunderstandings. The events in the story focus on Julian and his friends, all sixth graders. Consequently there is a lot of action revolving around sixth grade boys doing typical “sixth-grade-boy” things. There are dangerous stunts, and budding romances, and there is some language that you might expect from sixth graders out of earshot of adults. A few of the passages might not be appropriate for some readers, but as a whole the story is very appropriate for sixth graders. This is a good book for teaching foreshadowing because you know something bad as happened but Julian skirts the issue, leaving the reader curious about what he did. As the story progresses, Goldblatt drops little bits and pieces of information that change your perspective about what has been written previously. The historical backdrop does not play a very big role in this story so I put this in the category of realistic fiction rather than historical fiction. I can recommend this a read-aloud for the right class, provided you are comfortable with the pubescent passages and text. Aliki. William Shakespeare & the Globe. New York: HarperCollins, 1999. Print. Buyea, Rob. Because of Mr. Terupt. New York: Delacorte Press, 2010. Print. Canfield, Jack, and Mark Victor Hansen, Patty Hansen and Iren. Chicken soup for the preteen soul : 101 stories of changes, choices, and growing up for kids 9-13. New York: Scholastic, 2000. Print. Clements, Andrew, and Mark Elliott. Trouble-maker. New York: Atheneum Books for Young Readers, 2011. Print. Preller, James. Bystander. New York, NY: Feiwel and Friends, 2009. Print. Schmidt, Gary D. The Wednesday wars. New York: Clarion Books, 2007. Print. Shakespeare, William, David S. Kastan, and Marina Kastan. William Shakespeare. New York: Sterling, 2000. Print. Shakespeare, William, William Rosen, and Barbara Rosen. The tragedy of Julius Caesar : with new and updated critical essays and a revised bibliography. New York: Signet Classic, 1998. Print.